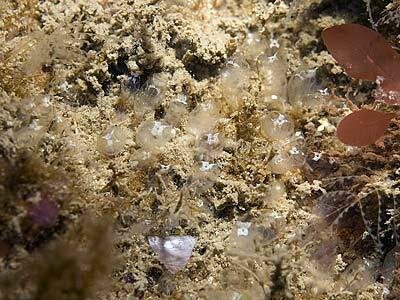 Description: This sea squirt is small, only 2-3mm in size, solitary but in groups joined by creeping stolons. Habitat: Usually in fairly strong tidal streams, attached to bedrock and wrecks, occasionally growing up hydroid and bryozoan colonies. 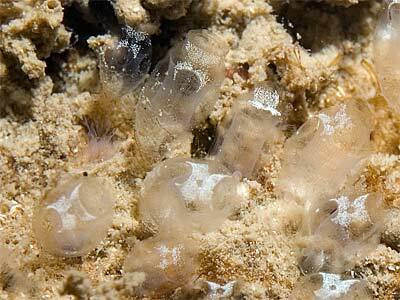 Ecology: The sea slug Colpodaspis pusilla has been observed possibly feeding on this species. Distribution: Not uncommon in the Irish Sea and North Channel between Scotland and Rathlin Island. Also present in the North Sea and SW Ireland. Similar Species: Quite easily recognised despite its small size because of the cross-shaped mark at the top of the test. Picton, B.E. & Morrow, C.C. (2016). Pycnoclavella stolonialis Pérez-Portela, Goodwin, Picton & Turon, 2010. [In] Encyclopedia of Marine Life of Britain and Ireland.